*Note: this is one of my more serious posts. It just kinda turned out that way. Let me know what you think about the slight change of voice. I’m not a believer in young love. I don’t think that teenagers really know what love is. I don’t think teenagers can feel true love. I don’t believe that “puppy love,” to borrow the colloquialism, can last, except in the most rare cases. And those rare cases make epic love stories. But that’s besides the point. Teenage romances are sweet, but short. We like these relationships to be taken seriously, although most don’t last longer than a few months. While they last, they are extremely sweet, sometimes to the point that it’s sickening. However, they are filled with constant drama. It’s in the nature of teenagers. We cause lots and lots of drama over unnecessary things. Blame the hormones. There are conversations all throughout the buildings of middle schools and high schools. This kind of gossip is heard everywhere. It’s in every whisper from best friend to best friend, every circle discussion between a group (especially groups of girls), every conversation in the locker rooms after gym class. It’s impossible to escape relationship talk. Eventually, the boy may cave in and ask the girl out. If she says yes, everyone is super excited for about a week, then they figure out someone else likes someone else and the whole cycle continues. The relationship lasts for a few months, then for whatever reason, the breakup happens. Maybe her best friend decided that he wasn’t right for her. Maybe he was spending too much time with his bros and she felt like she wasn’t important enough in his life. The reason is superficial. At least one person in the relationship becomes depressed for a month, then decides to pick themselves back up and focus on something important. And the cycle repeats. If she says no, she normally says something along the lines of, “I hope we can still be friends.” The guy gets his hopes up for a little while, realizes that it’s not worth it, and leaves. The cycle repeats when the world figures out he likes someone else. On the girl’s side of things, however, things are a little different. I’m not going to be sexist or anything, but I will stay in the general “social norm” that the guy asks the girl out. That’s how it is in most cases, and it makes it easier to write about this way. So, people find out that the girl likes someone. The whispers and the gossip are all around. She is often pressured to ask if the boy likes her back. Sometimes, her friends get involved and ask around. She often cries to her best friend, pining over him and sighing over the fact that he may not like her back. All she’s thinking is, “What if he doesn’t like me back? What am I going to do?” Obviously, her excitement is through the roof if he asks her out. However, if he doesn’t like her back, she’ll fall into a depressive state for a month. Sometimes longer. She’ll cry to her best friend, moaning about how much she loved him and how there is no other boy in the world like him. Then, she decides to pick herself back up and put herself back into reality and everything’s all happy again. And the cycle repeats itself again. I speak from personal experience. However, I’m not the girl pining and sighing over a boy. I have better things to think about than that. I am always the best friend. The one the guy talks to when he needs girl advice. The one the girl talks to when she needs to cry. The one that’s forgotten in every love story ever written. Maybe that’s why I hate romances. I’m that best friend, sidelined while a romance unfolds, always left out of the epic love story. You might say that it’s not about the best friend, it’s about the romance. However, I’d really like some credit. I’m usually the reason that the guy got the girl. I’m the reason why the girl can be happy again after finding out he doesn’t like her back. I’m the one with the shoulder to cry on when the breakups happen. I might not be an important character to the ones reading the story, but I sure as hell am an important character to the ones involved in the romance. Being the best friend is not an easy task. I watch my friends fall in love and get hurt over and over and over again. I’ve learned from their mistakes and eventually, I’ve learned that none of it is really worth it. I go through so much heartache. Not as much as the girl who just got dumped, but I have to watch friend after friend after friend get dumped. I have to console them and comfort them and tell them that everything will be okay. It hurts every time to see a friend so upset. And it wears on me. I hate watching my friends get hurt. 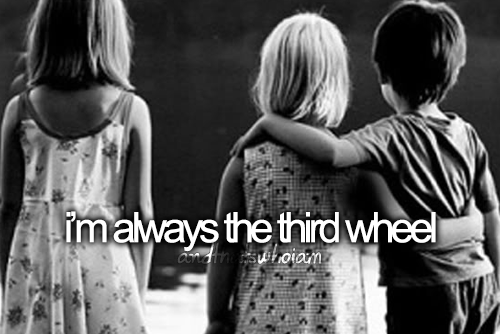 But every time, I’m the one that dries their tears. Teenagerism #1: Everything is a big deal! Teenagers make a big deal out of everything. Everything can tear their universe apart. Everything will ruin their lives. It’s absolutely ridiculous. That girl he likes doesn’t like him back? It’s the end of the world. She gets a D on ONE test? She’s convinced she won’t go to college. Of course, I believe I’m on the more reasonable side of the teenager scale, and I know I’ll make mistakes, people won’t always be nice to me, and not everything will go my way. And most of the time, I’m okay with that. But I have my moments. I’ve had so many friends that make a huge deal out of the littlest things. A dear friend of mine was the queen of drama queens. If you looked up “teenage drama” in the dictionary, her picture would be right there, her bright green eyes staring at you with a stony cold gaze. We’re teenagers. We perceive everything differently because we’ve seen enough to understand that bad things happen, but we’re still too young to understand that everything will be okay in the end. So, when faced with a teenager’s “crisis,” just hear us out. Please don’t make a big joke out of it. These “little things” are a big deal to us, and we’d appreciate it if the important adults in our lives treated them that way. I’m a sort of book bandwagoner. I read all the books that everyone’s talking about in the moment. I guess you could call me a mainstream reader. If it’s popular, I’ve read it. So, I read The Fault in our Stars by John Green. A friend of mine recommended it to me and I figured, well, lots of people love that book, so I’ll give it a shot. I came in with extremely high expectation for this novel, and to be honest, I was disappointed. Call me heartless, but I did not like that book one bit. My friend told me that it would make me cry, but I hardly felt any emotions throughout the book. Don’t get me wrong. It’s not badly written or anything, but it’s a romance. If you’ve never read TFioS, I’ll try to spoil as little as possible, but that will be difficult. A girl named Hazel Grace, diagnosed with a terminal illness, pretty much accepted the fact that she’d die, but then a medication is discovered and it saves her life. The story follows her romance with a boy named Augustus Waters, whom she meets in a support group. I feel like I have an obligation to like this book because it’s about a girl with cancer, but I really didn’t connect with her. I find Hazel’s intelligence pretentious and annoying, from her SAT vocabulary to her poetry. It was difficult for me to connect with her because I didn’t like her attitude and her personality. I couldn’t feel what she feels or see things the sees them. Augustus is a better character. He has a good sense of humor, but he is a bit too narcissistic. The book tries to portray him as “hot,” but I feel that he is a bit conceited. Peter van Houten’s character is very well written. I hated every bit of him, as I believe the author intended. He adds conflict and tension to the story, as well as a little bit of humor. All in all, it was a well-written book with a fairly predictable story line and well-developed characters that were difficult for me to connect with. 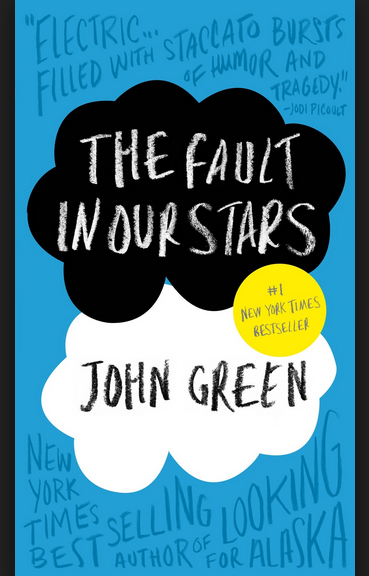 John Green is a great writer, but this is not a book that sits well with me. There are some very memorable quotes that I will definitely remember, but aside from that, it was not as enjoyable as most people make it to be. Alas, I am only one person living in a big world with lots of other people. My opinion obviously won’t make my decision for you. Her: So, do you have a boyfriend? Me: I said, “No, thank you.” I’m not looking for a relationship right now. Why not, you ask? 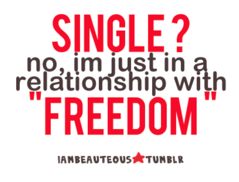 Because being single ROCKS. There are so many reasons why flying solo is the way to go! Freedom! You don’t have to make time for your significant other. It’s your time, and you can do whatever the hell you want with it. Go party, have a drink at the bar, stay home and have a Gossip Girl marathon, watch 4 football games at the same time, whatever! It doesn’t matter. Do whatever you want. Your boyfriend (or girlfriend) can’t tell you otherwise. You can make decisions without consulting anyone, and you can change your plans last minute much more easily. No drama. You don’t have to worry about your boyfriend getting jealous because you’re having lunch with your best guy friend, and you don’t have to worry that your girlfriend will be mad at you for blowing her off to hang with the bros. You don’t have to worry about stupid fights, tears, or heartbreaks. You have so much more time to spend with yourself, with your friends, and with your family. A lot of people realize a lot of things about themselves when they’re single: who they are, what they want in life, and what they’re looking for. You could do the same. You can meet so many new people. Make friends with people of the opposite gender. Flirt a little. You’re a great person. Why not find other great people to spend your time with, instead of being tied down to your partner all night? Sit around at home in sweats and no makeup with your hair in a messy bun all you want. Nobody’s judging. Skip a shower for a day? Fine. Forget to shave for a couple weeks? Great. Nobody cares. You can focus on lots of other things, like school or your career. Since you have more time for it, you’re bound to achieve more than you ever had before. 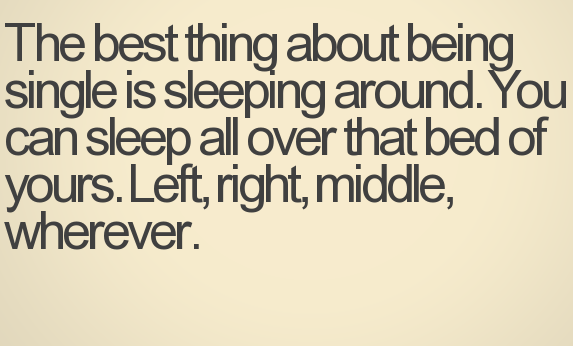 You get the whole bed, the bathroom, everything to yourself. No more waiting half an hour for your girlfriend to finish doing her makeup and hair. No more fighting over the covers. It’s all yours. It’s so much more exciting. With a specific partner, sure, it’s comforting because they’ll always be there. But it gets boring. When you’re single, you wonder. “Does he like me?” “Will she text me back?” It’s a lot of fun when you don’t know what’s going to happen next. You won’t miss super awesome parties or group outings because you’re stuck hanging out with your boyfriend. You can have tons of fun with your friends instead of sitting at home watching him play videogames. I really don’t understand why everyone feels the need to pair me up with someone else. Society seems to believe that being relationship-less is such a horrible, lonely experience, but “single” is not synonymous with “lonely.” Am I wrong to believe otherwise? Do I simply fail to realize how delicate and unstable my heart is, and that what I truly need is a man to make me whole? Am I supposed secretly cry myself to sleep, whine, and sigh about how lonely it gets? Absolutely not. Being single might have a few downsides, but when you consider the positives, it’s pretty awesome. There really is such thing as single and happy, no matter what anyone tells you. So go ahead. Make some new friends. Try some new things. Enjoy life. You’ll find your special someone someday. What is it about people that makes them attracted to other people? Why do guys like a girl and only see other girls as “just friends,” and vice versa? Two best friends can be so similar, but one is the object of a crush and the other is just a friend. What sets those two people apart in the crusher’s mind, when often times they are very similar? For example, a good friend of mine has a huge crush on my best friend, but I’m just a friend to him, even though my best friend and I act alike and think alike. I’m perfectly fine with him liking my best friend, but it makes me wonder. What is it about her that makes her crushable to him, but not me? And it’s the same thing the other way around. Why do certain guys like me and not her? So, with all these questions, I hopped onto Google and hoped to find some answers. I read a plethora of articles and learned a few things. Physical attraction is an important factor in most cases. The first thing people do when someone walks into a room is judge them by their looks. They may not be doing it consciously, but the way someone looks is the deciding factor on whether or not they will pursue the person and attempt to get to know them better. Proximity is also important. Okay, so the first time we see someone, we may not be impressed. But if we continue to run into them or see them everywhere, we will become more and more attracted to them. So, if we live near someone or sit near someone in class or work near them and interact with them, we may find ourselves become more attracted to them, which, I suppose, is why “boy next door” or “girl next door” love stories are fairly common. I guess Barney Stinson’s “mermaid theory” is actually true. The saying that “opposites attract” is not true. People are generally like people that are more similar to them because similarity encourages positive interaction. We actually subconsciously have a list of criteria for what we look for in a partner or a friend. When we meet someone who meets a large percentage of our criteria, we automatically like them better and find them more interesting. But if we find someone who doesn’t match our list of qualifications, we lose interest in them, even if it seems like everyone else loves them. We tend to look for people who remind us of other loved ones. Familiarity breeds attraction. People that have similar characteristics as people we know and love are more attractive to us because they validate our values and beliefs. Men tend to be more attracted to classically beautiful women, and women tend to look for the “dominant” or “alpha” male. I guess that’s why girls seem to tend to go for jerks, especially if they’re strong, confident, and popular. Attraction is an interesting emotion. Many different factors determine why certain people find you attractive and certain others don’t. I suppose, in the case with me and my best friend, some find her more attractive because they tend to interact with her more and others find me more attractive because they interact with me more. 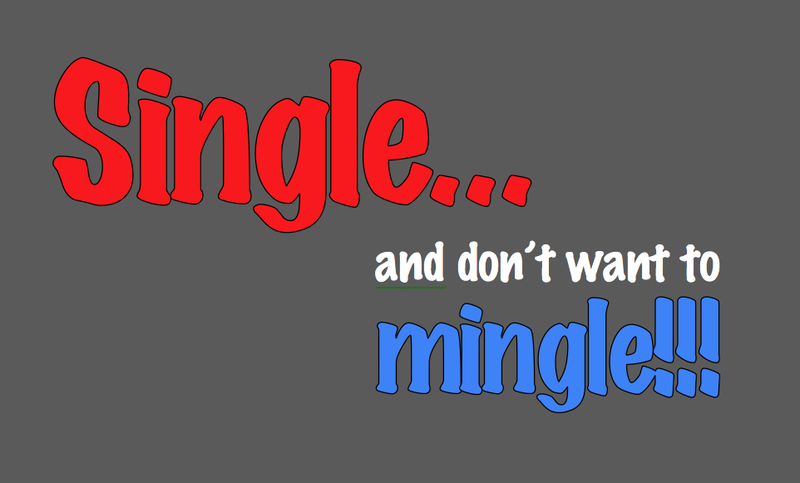 Positive interaction with someone breeds attraction, so if you want to get the girl (or guy), man up and talk to them! If the experience is pleasant, they will definitely like you a lot better. A really popular phrase I hear a lot of people say is, ”Nice guys finish last.” And let me tell you, it is the most annoying phrase I’ve ever heard in my LIFE. I really don’t get it. And I am here to tell you: nice guys DON’T finish last. It’s just some lame excuse that some guys use when they can’t get girlfriends. Not only that, it is completely, totally, 100% false. You know why these douches keep scoring all these nice girls? Because they’re man enough to ask them out. What have you been doing while some other idiot has been flirting with your girl? You’ve just been bellyaching about how she never pays any attention to you and how girls always go for douches and never give nice guys a chance. Umm, wake up call! How is she supposed to know how you feel if you never pick up your skirt, grow a pair, and TELL HER? Okay, now I know what you’re thinking. “I asked her out, and she still rejected me! Nice guys really do finish last!” Here’s the truth: she might be way out of your league. I mean, you wouldn’t expect Mila Kunis to date that one guy in the coffee shop who’s name nobody remembers. Hate to break it to you, bro, but that may be the case. Or, if you don’t want to believe that, there are lots of other reasons why she rejected you. Think about it. Are you really a nice guy? I mean, you have to be pretty darn arrogant to call yourself a nice guy and tell everyone that you got rejected because you’re nice. You did not get rejected because you’re nice. NOBODY gets rejected for being nice. And remember, while you’re so focused on winning over your “dream girl,” there’s probably another nice girl who’s madly in love with you and wishing you’ll stop paying attention to that girl and start paying attention to her instead. Think about it. You know that girl that you always go to whenever you need to rant about how your “dream girl” never pays attention to you? Give her a chance, too. You might be surprised. Now, if I still haven’t convinced you that you didn’t get rejected because you’re nice and you still think nice guys finish last, just remember. They always save the best for last.